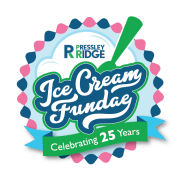 On August 11th Pressley Ridge is hosting its 25th annual Ice Cream Fundae at the Pittsburgh Zoo and PPG Aquarium! Pressley Ridge is looking for volunteers to help out at the event to make the experience fun and exciting for our guests. Choose from a variety of volunteer opportunities such as face painting, mascot escorts, and many other fun opportunities! All of our proceeds go towards Pressley Ridge children and families, helping to make their future bright. For more information please contact Kaitlyn Wolfe or visit our website at www.pressleyridge.org/icecream.